I have been something of a fan of Jane Austen since I was 11 years old. My favourite book is actually Persuasion, rather than Pride and Prejudice. Of course I cannot share Anne Elliot's distaste for Bath, and it used to be that I would picture Anne and Captain Wentworth as I passed the Assembly Rooms or the Pump Room, but I guess familiarity really does breed contempt. Well, not exactly contempt, but a certain tendency to take it for granted. This weekend my three favourite Swedish friends (referred to by Mark as 'the Swedish ladies') came to visit and re-opened my eyes to my adopted Georgian home town. I live in Bath only because it is where Mark lives - he was born and bred in Bath and would be loathed to live anywhere else, whereas I have moved around so much, I am not tethered to a place. The Jane Austen link is merely a fortuitous bonus. I also am fortunate to have been given my godmother's tiny holiday flat in Dorset and when Irene last visited, we spent most of her visit there. It is just a short drive to Lyme Regis and we relived Anne and company's visit in Persuasion, walking along the Cobb, too scared to jump from the worn stone steps without a Captain Wentworth to catch us (not that that did Louisa any good!). 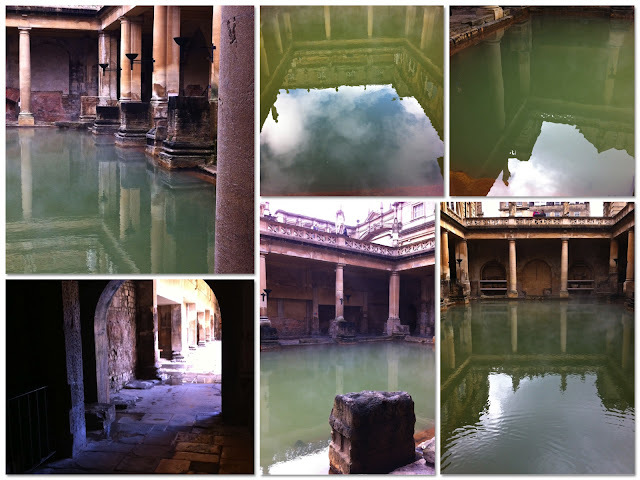 So this visit it was Bath's turn for us to get all Austen-y. Seeing Irene's eyes light up as she spotted the colonnade between the Pump Room and Union Street where Amanda Root met Ciaran Hinds in my favourite adaptation of Persuasion re-charged my enthusiasm. To save Mark from death by chatter, we decided to all stay somewhere other than my house. While looking for a reasonably priced B&B or apartment we stumbled upon Bath's bed and breakfast on a boat, which was both reasonably priced for the four of us and quite an adventure. On Friday Mark and I picked up the keys to the boat and were instructed on the important details and then went to pick up the Scandinavian crew from Bristol airport. It was very late when we got back to Bathwick and clambered aboard by torch light (electric/iPhone torches not the viking flaming variety!). 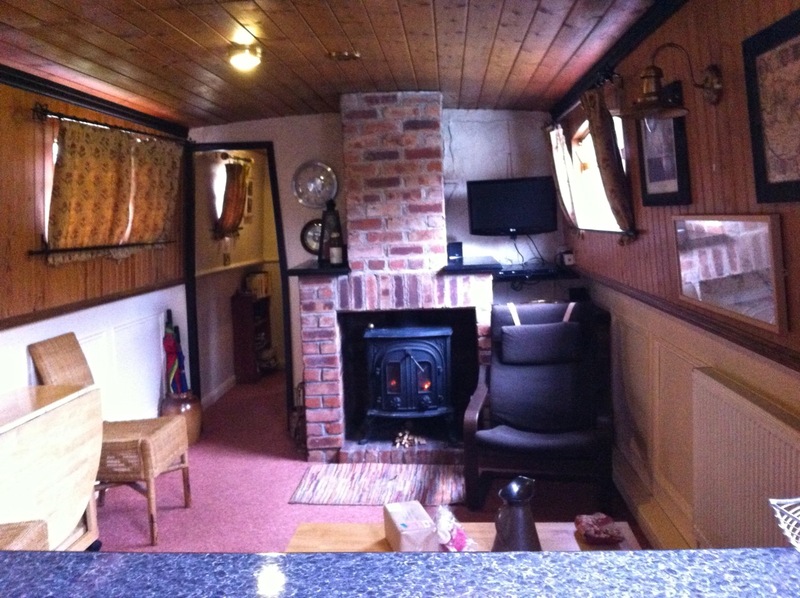 When we arrived the boat was cosy, with a wood burner and central heating (although we didn't manage to keep the fire alight again during our stay and I slept Sunday night wearing two jumpers and a pair of slippers!). 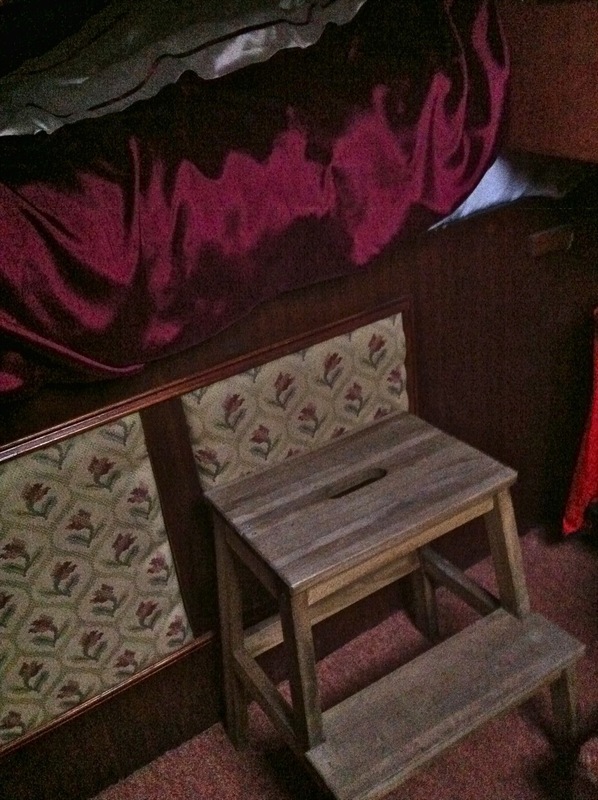 The boat was cleverly arranged to make the most of the space available so the bed in Anna-Karin's cabin extended underneath the bed in Irene and Annika's cabin - the little steps to let my friends climb in to the high-level bed reminded me of 'the princess and the pea'! I confess I had very little sleep on Friday night. It was so stormy, the boat was knocked about by the wind and the noise and movement left me wide awake and worrying that the boat would come away from its moorings and we would wake to find ourselves miles away...or worse, up to our eyes in canal water. Needless to say all was well and Saturday saw us well breakfasted and on our way to the Roman Baths. 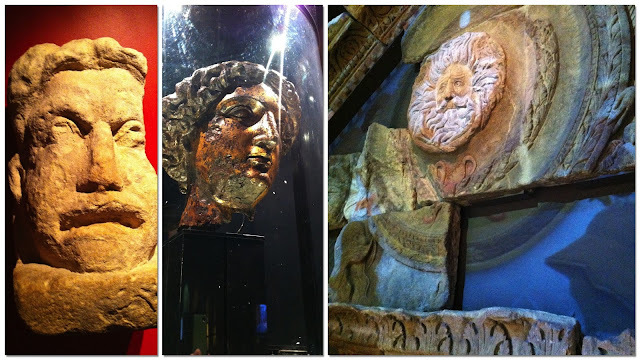 I have been to the Roman Baths a number of times, but I always see something new - and with visitors, you get a different perspective. 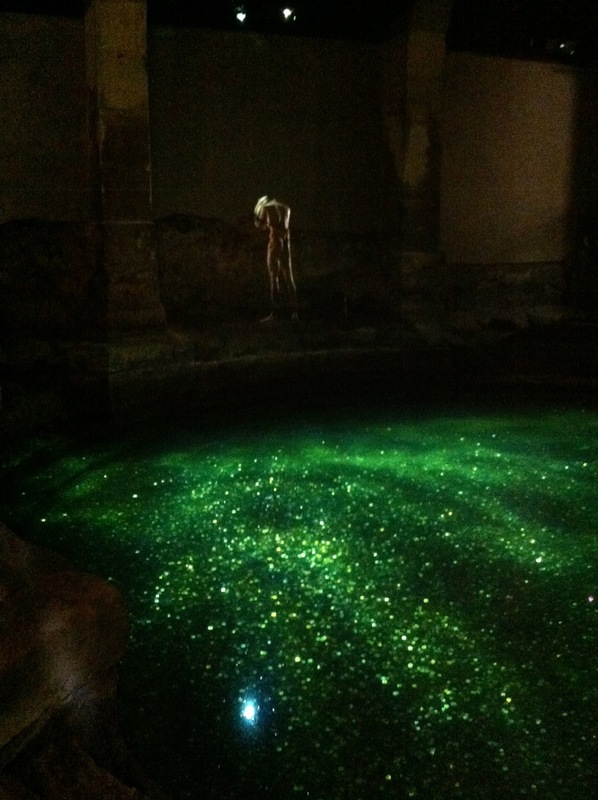 The baths are beautiful and by getting there early, you can see it without the crowds (or queueing in the rain). 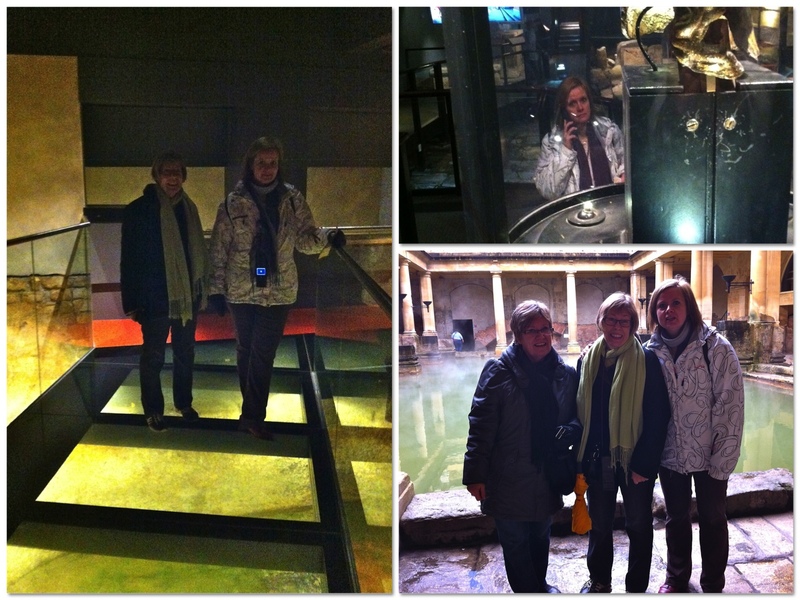 Throughout the baths there are video clips projected on the stone to add atmosphere to the ancient site. My Scandinavian visitors were so absorbed by the way the lights were catching the donations in one of the pools, they didn't even notice the disrobing images projected on the wall! After the Roman Baths, we had a bit of a wander and popped in to the Bath Tea House Emporium (as I have been raving about it for years) for a white peony tea and a yellow tea, accompanied by cake (jasmine tea and orange loaf, lemon drizzle and chocolate honey cake). Only Anna-Karin resisted sweet temptation - although that didn't last long. 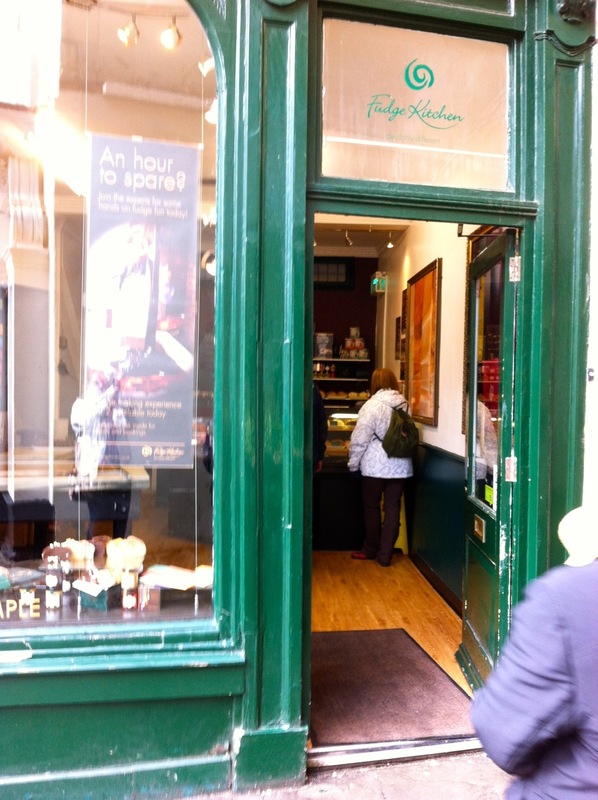 One of my favourite moments of the weekend was the expression on Anna-Karin's face when she found out there was a shop in Bath that sells nothing but the fudge they make on the premises! Being something of a wimp, I decided that I needed to sit down for a bit and popped back to the boat. No sooner was my back turned than my friends scurried off to a traditional English pub! 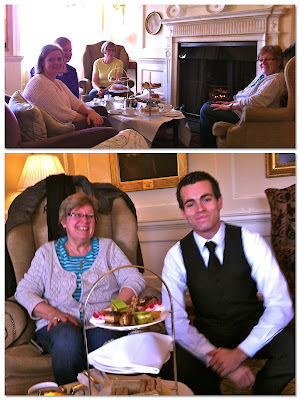 We met up again a little later and headed up through the city to the Royal Crescent Hotel for afternoon tea. 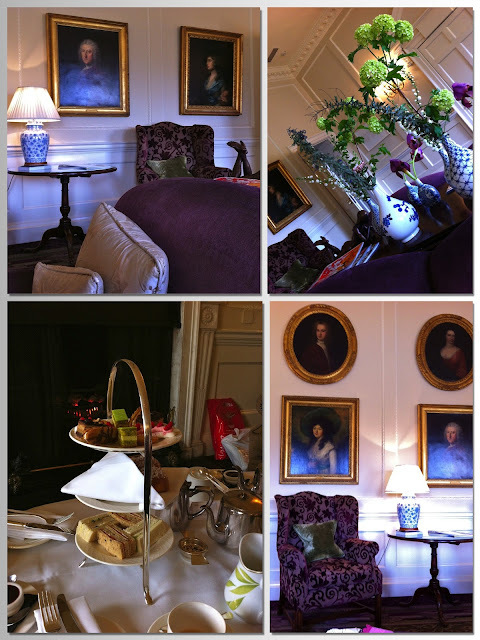 I am a big fan of a traditional afternoon tea and had heard that the Royal Crescent Hotel's is one of the best. When I booked I asked if we could take tea in one of the lounges rather than the dining area and when we walked in, we were shown to a lovely lounge tastefully decorated, with portraits on the walls and a bevy of vases of cut flowers, overlooking Victoria Park with the city of Bath spread out before us. It was beautiful! We had been reserved a large sofa and two winged armchairs by an open fire with a low coffee table set for afternoon tea. We were brought a three tier cake stand between two and a choice teas - I have discovered Anna-Karin and I are tea twins (which reminds me, I must get myself a bag of lavender tea from the tea house emporium). We decided to start with the bottom tier of sandwiches (smoked salmon, ham and tomato, egg and cress and cucumber), before moving on to the still warm scones and bath buns served with clotted cream and strawberry jam, and finishing with the sweet delicacies on the top tier (pistachio cake, meringue with raspberry cream, viennoise, chocolate/coffee gateau and tarte au citron). Actually, it would be more correct to say the top tier finished with us...as we were beaten by the extravagance of the tea. We had had an 'elegant sufficiency' and gratefully accepted the offer to box up the left-overs for us to take back to the boat. We were all admiring of the wonderful spread (although I suspect Annika was almost as admiring of the handsome young waiter!). The hotel was beautiful and the afternoon tea was out of this world, but I think what really made it special (apart from my fabulous Viking friends) was the staff at the hotel. It is a very grand hotel and I think we all felt a little as though we were fakes and would be thrown out at any moment, but the receptionist and waiting staff made us feel relaxed and at home and as though we deserved such special treatment. There was no hint of snootiness, just a genuine desire to make their guests' visit a happy and memorable one. When I booked the tea it had seemed like a one-off extravagance, but now I am already planning a return visit - perhaps in the Summer when we can sit in the beautiful garden. 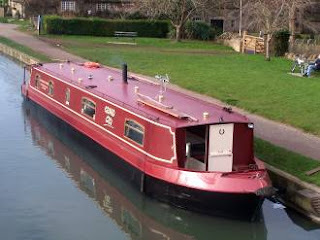 We returned to the boat glowing with happiness, full and contented. Somehow when we had settled down in the temporary warmth of the fire-lighters and kindling (the logs were far too damp to catch) with a glass or two of prosecco, we still managed to put away most of the delicious cheese I bought from 'the fine cheese shop' on Walcott Street (another place where the helpful and friendly staff are as much of a draw as the gorgeous cheeses). On Sunday morning we had a lazy breakfast of homemade calorie-free spiced apple cake and clotted cream, fed the ducks and then it was time to hand back the boat. Mark and I took away the bags while the vikings Jane Austened themselves up at the Jane Austen Centre. I so wish I had gone with them as there is a dressing up opportunity that wasn't there last time I went. I really hope Irene posts photos! The vikings then soaked up a bit more culture at the Holburne Museum and enjoyed a fresh salad at the garden cafe (always necessary for sea-faring vikings to prevent scurvy) and we picked them up to head back to the airport. It has been a wonderful weekend, and I will have a load of happy memories...the 'blooming tree', the know it all Bath redhead pointing out our moorings on the map beside the canal until clever viking number 2 asked, "So we are not where it says 'you are here'? ", the fudge obsession, the clotted cream appreciation society, the strange noise from the boat in the middle of the night and the kindly vikings who put in ear-plugs rather than disturb me at the other end of the boat, the vertically challenged viking unable to reach the switch on the ceiling lights...oh and so many more! Finally, just one note to any would-be Mr Darcy types...whilst admiring Lizzie Bennett's fine eyes is a good thing, exclaiming about the beauty of Anna-Karin's eyes in the same breath as asking your girlfriend if her particularly bad batch of spots is due to the medication she had to take for her asthma a few weeks back, is not the way to get your favourite dinner cooked for you! However, I do have to point out that said would-be Mr Darcy can be quite gallant when he chooses, and responding to being told of the shop assistant who thought Irene was Anna-Karin's mother with declaring it is only because Anna-Karin does not look like she could possibly be more than 30 and that Irene does not look old enough to have the children she actually has was...well...kinda nice. 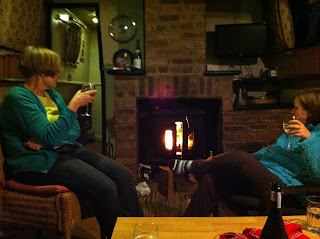 IF I feel very brave (or have had a glass of wine - preferably two) I may post pictures of us in all our Austenesque glory. Maybe... A post will most probably be published tonight! p.s. I hope you don't mind my copying your collage type photo layout - there were just too many photos otherwise. I think collage type of photos are very convenient sometimes, please feel free! I love the Jane Austenesque photos!!!! Thanks a million for a lovely weekend. See you soon again, hopefully! I definitely hope to see you again soon - either in UK, Sweden, or somewhere else we can all get to. (((hug))) it was so lovely to see you!